See my Unicorn Horn bath tub Demo below. 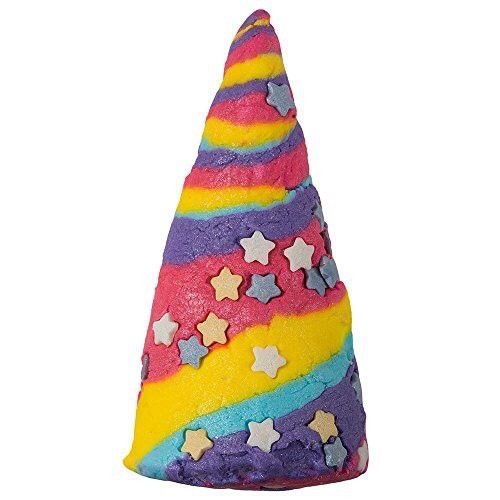 Here’s a photo of the latest 2019 Unicorn Horn gift set with the Unicorn Horn bubble bar. Unicorns are probably real. But, even if they’re not (don’t worry they definitely are) you won’t mind! Relaxing lavender oil meets mood-brightening neroli in this lustre-filled bar. Neroli oil increases serotonin levels in the brain which makes us feel contented and cheery, so you can ponder the existence of magical creatures while building a fairytale landscape of feel-good, fragrant bubbles. Here’s what the 2014 Unicorn Horn looked like. Posted on January 24, 2016 by Lushalot	• This entry was posted in Easter 2016!, limited edition, Lush Valentine's 2019, Valentine's Day and tagged lavender, lush unicorn horn 2018 Valentine's day bubble bar, lush unicorn horn easter bubble bar review demo, silver glitter, silver lustre, silver shimmer. Bookmark the permalink.